Since I began creating work in my early career I have been concerned with notions of live performance existing in within a world of projected visual imagery. 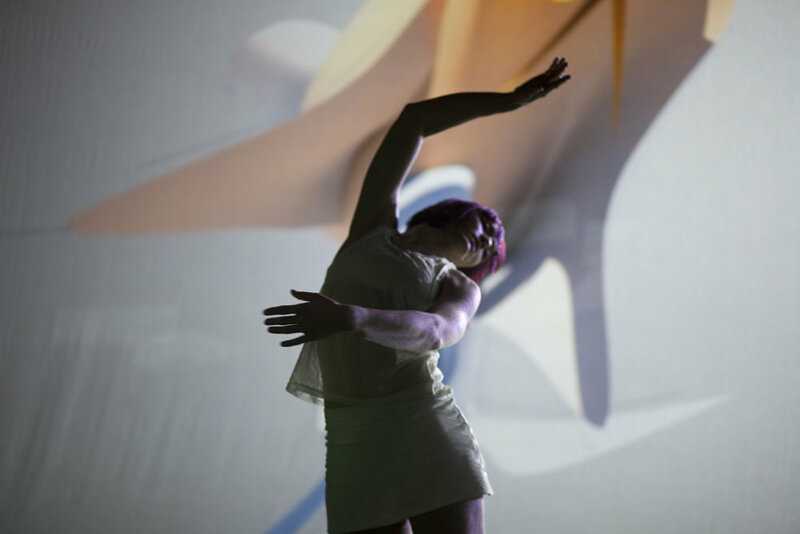 As a contemporary dance artist I have interacted with digital technology and visual imagery choreographically in order to communicate concepts in my work. In doing so, many curiosities and tensions have arisen within my practice which have raised questions about the relationship between the live body, and moving images. As I embarked on my practice-led research the opportunity presented itself to experiment collaboratively with animator Paul Van Opdenbosch, using a Xsens MVN motion capture system. In working with this new technology and a new working relationship with Paul, I was able to gain a different perspective on my work and my movement data became the basis for three experimental generative animation outcomes. In my research of the history of moving images and animation the concept of ‘chronophotography’ became of particular interest. I was really attracted to the way that the body’s movement could be fractured into smaller components in order to give more time for the viewer’s mind to perceive the temporal qualities of an action or movement. I am concerned also with the sensory experience of object, time, space and context. My practice has suggested that images and bodies both ‘speak’ strongly of ideas and sensory experiences. I want to establish a space where they will co-exist in a dialogue with one another. Video (above) Dance. Moving Image. Animation. Technology. Shifting Lenses was performed on Thursday 2 July & Friday 3 July, 2015 at 6.30pm in the Woodward Theatre, Creative Industries, QUT, Kelvin Grove Brisbane, Australia.